On the corner of McKinney Avenue and Olive Street in Dallas’ Uptown neighborhood stands McKinney & Olive, an award-winning office building designed by famed architect César Pelli. The building offers 536,000 square feet of Class A+ office space and upscale retail as well as restaurants, a rooftop terrace, fitness studio and conference center. 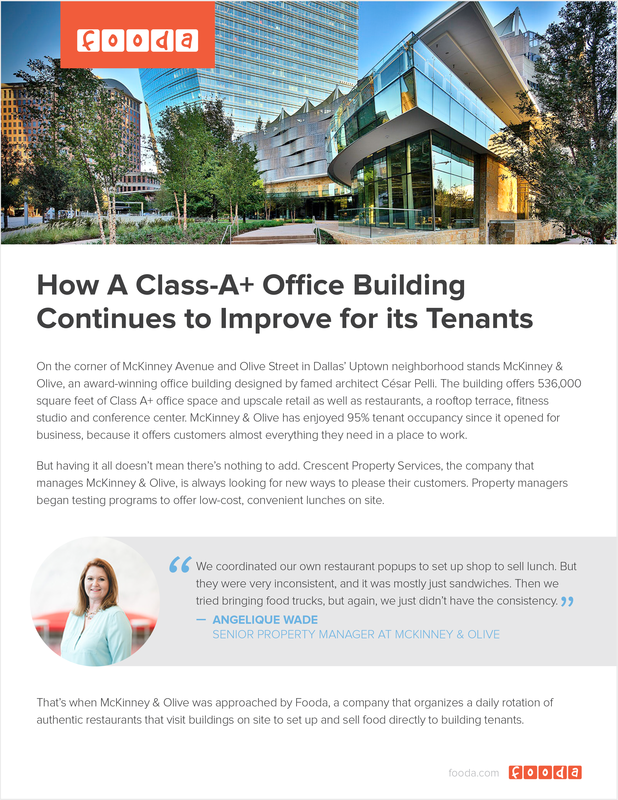 McKinney & Olive has enjoyed 95% tenant occupancy since it opened for business, because it offers customers almost everything they need in a place to work. But having it all doesn’t mean there’s nothing to add. Crescent Property Services, the company that manages McKinney & Olive, is always looking for new ways to please their customers. Property managers began testing programs to offer low-cost, convenient lunches on site.